Less than six months after the company’s first app, children’s entertainment company Hullabalu has released its second installment of the Pandora series. But this time, the tale of Pandora, a plucky and courageous panda bear on a mission to find her parents, opens the door to the company’s strategy for releasing content. Hullabalu raised $1.8 million earlier this year from a lengthy list of funders, including Reddit creator Alexis Ohanian, to tackle children’s entertainment for the tablet generation. The company’s first app, Pan: The Fearless Beribolt, was released in June of this year and climbed its way to the top of the iTunes book section. Perhaps even more interesting, Xie said that the first app has seen an average of 15-minute periods of engagement — quite a long time, considering the attention span of most four-year-olds. And it’s no secret why Hullabalu is finding success on the tablet: One of the fastest growing demographics for tablets is kids. According to research from Mixpanel from September of this year, 77 percent of children’s app activity happens on tablets, compared to just 10 percent on mobile phones. Data from Nielsen corroborates that outlook in a study from last year, which reported that more than three-quarters of tablet-owning parents allow their children to interact with the device, and 20 percent would encourage the behavior if there were more educational games involved. Xie said that Pandora’s story is designed to not only delight and inform kids who have yet to hit kindergarten, but is packed with little references and themes that give something extra for older kids (and parents). 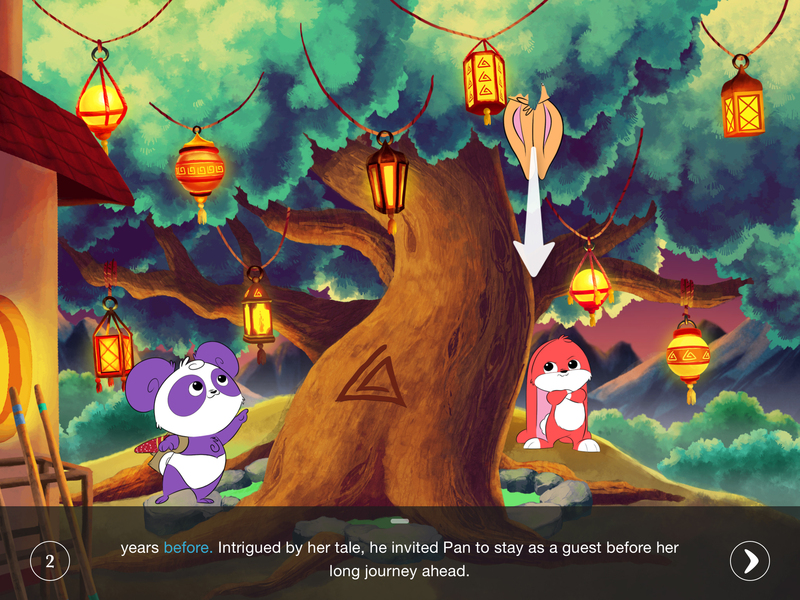 The formula of Hullabalu’s second app, Pan: Chasing the Keeper, keeps largely to the former installment’s tone and style: Pandora reaches the rabbit-populated Karakorum Keep, where she embarks on a friendship with a personality foil named Chase. However, instead of wrapping the story up neatly, the app ends on an ominous note that reads more like a first chapter than a standalone storybook. The app is structured that way to set up for the upcoming five installments of Pandora’s story, Xie said. The concept is rather clever: by utilizing cliffhangers, Hullabalu hooks in curious kids who are eager to follow Pan on her journey. It could also lead to loyalty, and continued installment purchases. Xie did not shed too much light on the company’s future content strategy, but did indicate that each part of the story will have its own app. “We’re also releasing mini-apps within the coming months that will also be companion activities for kids as they play through the stories with Pan,” Xie said. Children are already becoming an important demographic for the tablet market, but Hullabalu is entering a space that remains relatively sparse. While proprietary characters like Elmo and Dora are at the forefront of kids’ tablet media, Pandora was born for mobile. It will be interesting to see whether her character can transcend the tablet, and become a star in the fickle world of kids media. Great news and very interesting data on children’s app activity! Thank you Lauren.